The 2013 NFL season is right upon us now & it looks like it could be one to savour with several teams making moves to challenge for the Super Bowl right now & the usual powerhouses still fielding strong sides. We're taking a look here at some of the best antepost bets for the season that will culminate in the Super Bowl on the first weekend in February 2014. Last year we gave the San Francisco 49ers to be the NFC champions at 7/1 & they duly obliged so hopefully we can pick out some more value here. This year everybody has been talking about the Denver Broncos who start with legendary passer Peyton Manning for the 2nd year after his move across from Indianapolis after a serious injury & it's easy to see why the Broncos have been the talk of the league with several big moves. The addition of the prolific Wes Welker at receiver was probably the most eye-catching move; he's had over 1,000 receiving yards in 5 seasons & Manning will relish having him to pass to. Welker is 32 though & that's probably why the Patriots let him go, the Broncos are going all out for this season & that could put the pressure on from a very early stage. They've also added to their defense at the deep positions with the signings of the veteran safety Quentin Jammer & the excellent Dominique Rodgers-Cromartie at cornerback. We really like Rodgers-Cromartie who probably wasn't used to best effect at all times in his two years in Philadelphia but he was great at Arizona previously & could be a key player here. It isn't all good for Denver though with their running game looking light now Willis McGahee has departed, it is a passing league now though so maybe they'll get away with it & just because teams know they'll pass a lot doesn't mean they'll be able to stop Peyton anyway! A bigger loss to the Broncos was that of their ace defensive end Elvis Dumervil who ended up going to Baltimore in part due to a late submission of paperwork by his agent. 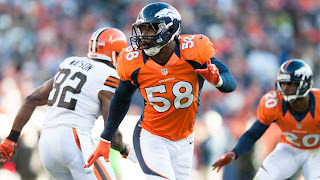 The worst news though was the suspension for 6 games (of their 16 game season) of their star defensive player, outside linebacker Von Miller for a substance violation. Miller is one of the league's very best players & with him missing it could mean the Bronco's don't end up winning quite enough games to be a top seed in the playoffs. The AFC West should still be a formality for them but without home advantage through the post-season their odds look short enough for the AFC & the Super Bowl so are reluctantly passed over. We were keen on outright glory for the Houston Texans last year & not too much has changed to think they shouldn't be right there again this year. They amassed an impressive 11 wins from their first 12 games last season before slumping at the end to 3 losses in 4 & missing the AFC's top seed that would have kept them at home throughout the playoffs which is key as they're a dome side meaning inclement winter weather can really harm their chances. 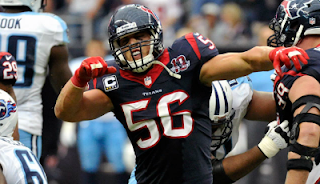 Some labelled the Texans as 'soft' but we're not sure it was a choke & it's no coincidence the slide came when their dominant inside linebacker Brian Cushing was injured, we're certain if he'd stayed fit the story would have had a different outcome. The Texans have some of the best players in key positions in the league with Arian Foster an elite running back, Andre Johnson an ace wide receiver, Brian Cushing as already mentioned & the 2012 defensive player fo the year J.J. Watts at defensive end. Add to that a very good offensive line, including maybe the game's best left tackle Duane Brown, & it's difficult to see how they won't end up close to 13 wins this year but many doubt the capabilities of the quarterback Matt Schaub. Schaub doesn't have a reputation for being a 'clutch' player, meaning he doesn't come up with the plays in key situations often enough, but he's definitely highly talented as evidenced by him leading the league in key passer stats in 2009 (passing yards, completions, yards per game & attempts). If defensive co-ordinator Wade Phillips can keep his young & hugely talented defense firing Schaub may not have to improve much anyway as they should always be in with a chance whilst keeping their opposition's scoring opportunities low. At 7/1 to win the AFC Houston seem to be the value picks as we think the New England Patriots may eventually start to slow this year after being exceptional for so long & the Broncos are just to short in price. Of the other AFC contenders according to the bookmakers we don't think the Ravens will even win their division (we like the Bengals in the AFC North so that also rules out Pittsburgh who could end up with a losing season) & 2013 is too early for the improving Colts, Dolphins & Chiefs. The NFC looks stronger than the AFC this year with powerhouses like the San Francisco 49ers & Green Bay plus the impressive & improving Seattle Seahawks & always dangerous New Orleans Saints & Chicago Bears but the only team we want to side with is the Atlanta Falcons. The Falcons are just scary in the passing game with a very good quarterback in Matt Ryan helped out by an amazing receiver corps of the ever youthful Tony Gonzalez at tight end & Julio Jones & Roddy White at wide receiver. The latter two thrive in the NFL with the rules helping their style of play by very much favouring them against the cornerbacks who will be trying to stop them - it's possible we could see Matt Ryan throw for career high numbers this year with them to aim at. 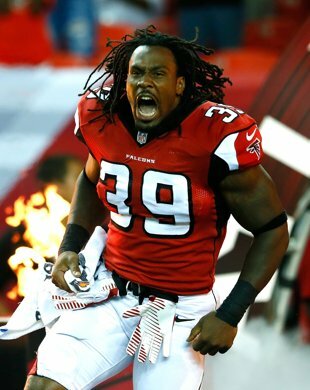 The big improvement on offense has been the capture of Steven Jackson from the Rams at running back & he should mean that they can run the ball & use up the clock once they establish their now customary leads in games. Getting pegged back late on due to their inability to pound the ball up the middle really hurt Atlanta last year & it could be key to them getting their number one seed this year & staying at the Georgia Dome where they are so dominant. Atlanta have also tried to improve their defense this year & taken a gamble on the now veteran defensive end Osi Umenyiora from the Giants but if he stays fit he'll add another dimension to their play bringing real aggression & pressure on opposition QB's - along with Justin Babineaux at defensive tackle they could have a lot of sacks this year. They've also looked to upgrade at cornerback with their first two draft selections & Desmond Trufant looks like he could thrive in the professional game, with their safety positions already solid look out for a much improved defensive showing this year. Again like the Texans in the AFC Atlanta just look the value here with Seattle & San Francisco too short as joint favourites considering they'll have to play each other twice in the regular season meaning dropped games & Green Bay need to improve a little defensively even though their offense remains incredible. Take big odds of 9/1 for Atlanta to win the NFC & even bigger odds of 18/1 for them to collect their Super Bowl rings in early 2014. I disagree about the Super Bowl winner and the AFC Champion. It will be Denver, Seattle, or San Francisco to win the Super Bowl. Obviously there could always be a surprise team, but it won't be the Texans and I think the Falcons are a step below Seattle and San Francisco. They just don't have what it takes to push it over the top. Also, I would be surprised if Arian Foster makes it halfway through the season.